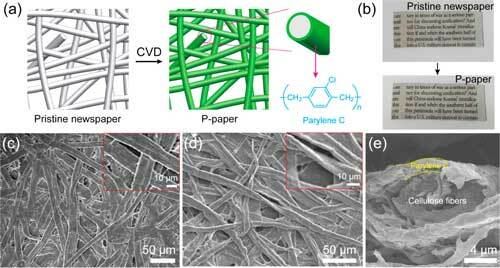 (Nanowerk Spotlight) Paper, probably the cheapest and most widely used flexible and eco-friendly material in daily life, is a promising substrate for making flexible devices ranging from electronics to microfluidics, energy storage and sensors. What makes paper such a useful substrate are its attractive features: chemical stability, strong mechanical strength, biodegradability, functionality, and permeability. However, when paper is wet, its mechanical properties are badly affected. Furthermore, although paper porosity is attractive in terms of electrochemical reactions, the high porosity and surface roughness of common papers limits good electrical connections with metal nanoparticle lines deposited on paper. "In order to use paper as a platform, some surface treatment is required and various materials, such as wax, organic/inorganic polymers, and ceramics, have been extensively investigated to determined how they modify paper surfaces – e.g., wettability, functionality, and roughness," Dr. Kyoung G. Lee, a Senior Researcher in the Nanobio Application Team at South Korea's National NanoFab Center (NNFC), tells Nanowerk. "In most cases, solution-based coating methods have been adopted, but these methods often require a complicated experimental procedure, involving polymer synthesis, a coating process, and curing step. Moreover, surface tension effects when solution-based methods are used, lead to poor coating conformity and may bury the porous structure of papers." To overcome these challenges, Lee and his collaborators have developed a new and reliable method to achieve conformal coating of individual cellulose fibers in the paper and the fabrication of a metal electrode via patterning of gold and silver layers on the coated paper. The team has reported their findings in ACS Applied Materials & Interfaces ("Flexible and Disposable Sensing Platforms Based on Newspaper"). "Conformal coating or formation of thin polymeric layers inside of porous materials, especially papers, has been considered as a major bottle-neck in this field," explains Lee. "In our present work, we have developed a simple and scalable process for the fabrication of flexible and disposable sensor platforms based on coating the surface of common newspaper with polymers by chemical vapor deposition." 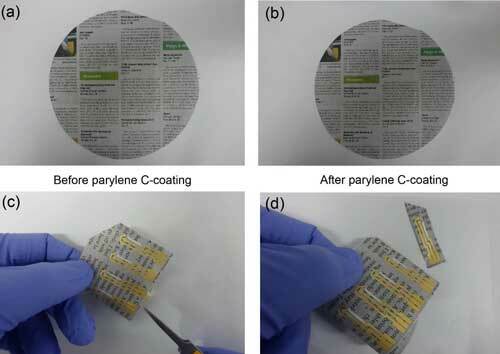 To fabricate their flexible and disposable sensor platform, the researchers developed a simple and scalable process based on coating the surface of a regular newspaper with parylene C by chemical vapor deposition (CVD). The scientists selected parylene C coating as barrier layer for the fabrication of paper electrodes because of its low surface energy (19.6 mN m-1) and low stick coefficient (<1 x 10-3 at room temperature). "In addition" Lee points out, "CVD, because it is a dry and single step process, enables a conformal surface modification and enhances mechanical properties as well as increasing the hydrophobicity of paper while maintaining its porous nature." In order to demonstrate the superior performance of their coated paper, they used it as an electrode platform for an electrochemical biosensor used to detect foodborne pathogens. Selecting E. coli O157:H7 as a model foodborne pathogen, they were able to demonstrate high sensitivity and specific detection of this pathogen. During the manufacturing of paper, a variety of chemicals are used to support the papermaking process itself and additives are used to enhance the performance and functionality of the final paper product. With untreated paper, these additives would leak out from the paper and could influence the sensing results. However, the polymeric coating help to avoid such problems even the paper is exposed under water for a day. This means the conformal coating process enhances the reliability of the substrate. "So far, we have confirmed the mechanical enhancement and sensing performance using polymeric coated waste newspaper only in limited conditions," Lee cautions. "However, most of the bio and chemical sensors are performed under diverse pH conditions, temperature, and solvents. Therefore, we will further investigate how those conditions effect on the mechanical, chemical, and performance of paper-based sensor platform." The paper electrodes developed in this work could provide reliable, low cost, and disposable sensing platforms for point-of-care testing biosensor systems and ion sensing system. Such flexible sensing platforms are a key component for the development of smart portable devices targeting of healthcare, environmental monitoring, point-of-care diagnostics and personal electronics.